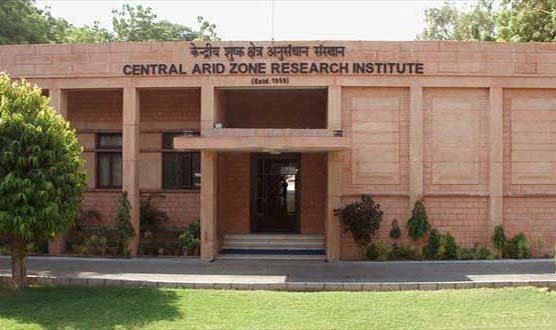 केन्द्रीय सूखा क्षेत्र अनुसंधान संस्थान, जोधपुर । Central Arid Zone Research Institute (CAZRI),Basni, Jodhpur: Central Arid Zone Research Institute was established by the Government of India in 1952 in Jodhpur, a city in the state of Rajasthan. It was previously known as Desert Afforestation Research Station until it was renamed in 1959. The objectives of the Institute are to find ways to stabilising shifting sand dunes, establishing silipastoral and firewood plantations, planting windbreaks to reduce wind speed and subsequent erosion, rehabilitating degraded forests and starting afforestation of barren hill slopes. It has a small pictorial museum with a photographic exhibition illustrating the institute's work. The arid zone of India covers about 12% of the country's geographical area and occupies over 31.7 m ha of hot desert and about 7 m ha is under cold desert.